The products that TKL makes are based on items sailors made to improve the appearance of a vessel and protect it at the same time. We wish to provide a brief look into knotwork with the hope that a few people will be interested in learning more about the art. We teach classes in everything from tying your shoes to somewhat complicated fancywork. It is our sincere hope that a former student will stop by and show us something that we have not seen before. Mats and fenders provide protection for the decks and sides of the vessel. Other items are used to improve the sailors' grip on the swinging lines aloft. As the ships rig became larger and more complex, Marlinspike work evolved, because sailors had to go further aloft. Handrails and safety lines are rather slippery late at night when the sea is howling, so sailors developed a number of knots and coverings that would improve their footing and grip in the rigging. They even improved the handgrips on their tools. Some items were purely decorative such as the bell ropes which hang from the Ships Bell clapper or chest handles on the seaman's chest. From an austere beginning eons ago, the art and science of knot work and rigging has evolved into a highly engineered science today- a far cry from a log raft. Today exotic metals, synthetic fibers, and plastic have replaced wood and natural fiber. However, one thing has not changed: the pieces still have to be joined together to work in concert. Knots and splices are still applied to the lines that raise and control the sails. In many cases wire rope has replaced fiber lines. But the basic principals still apply. Ropes or cables still work under tension and knots hold by friction. The simple idea that friction is the key that holds a knot together is astounding. The idea is that if one turn does not hold the load, increase the friction by adding another turn. For example, the jib sheet exerts a force that must be controlled to trim the jib. If the sail is small enough the sheet may be held in the hand. However, before long that hand is needed to hold something else (namely to hang on.) Or perhaps we need to apply more tension to adjust the set of the sail. As the sails became larger more force is needed to trim them. In order to trim the larger sails the sailors had to resort to some sort of mechanical advantage, usually in the form of a winch or some form of tackle. Sailors coined a term "Handy Billy" which is a small block and tackle of three to four parts. Today a single line sheet is usually warped around a coffee grinder winch head and the winch is turned. 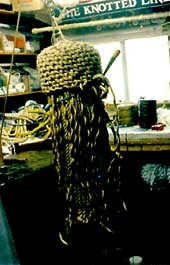 Rigging in the form of Knotwork started in the dim reaches of past when primitive man first lashed logs together to form a raft to travel across a body of water. The raft was usually composed of logs that he could carry to the waters edge and tie together with vines that grew near by. Early sailing vessels were relatively simple. A large pole to hold up a yard that carried a triangular sail. It wasn't until later in history that ships had compound masts. The compound masts were like trees in the deck, with another mast added to the top of the first mast. Each section had to have its own separate guying system. Sometimes a stopper knot was needed when a line was to be attached to a dead eye. An example of a stopper knot would be a Matthew Walker Knot on the end of a shroud lanyard. The lanyard would be roved through the deadeyes of the shrouds. As the rig was tuned the deadeye lanyard was pulled up tight with one of the halyards on the mast. The pair of dead eyes would act like a block and tackle and tension the shrouds. Now remember there were several sets of shrouds depending on how many sections there were in the mast and how many masts. In the mid 1800's rope craft was at its zenith. Whaling expeditions lasted up to four years, where the ships sailed to ends of the earth and back in search of the whale. The Crew had miles of standing and running rigging to maintain while under way, and the ships' stores stocked material to repair the rigging. However, they did not bring all of the sizes of ropes that were necessary for the ship. The sailors had materials sufficient to make what was needed in the way of standing and running rigging. Standing rigging was usually the larger lines used to guy the masts and other spars. By definition standing rigging did not move to perform its action. On the other hand running rigging moved to perform its function. For example, halyards and sheets are running rigging. Whalers would put to sea with four times the crew required to run the ship. As a result many crafts flourished. The crew had many idle hours to fill so they turned to crafts that would have raw materials on hand. Crafts such as woodcarving, scrimshaw, rope craft and shell work were used to fill time during a passage. The ships rigging became very ornate, with all of the specialized knots and lashings. Hand-carved mop handles were not unusual. Scrimshawed whale teeth depicted the significant adventures of the voyage. As the Ships' crews were reduced in size, time for handicrafts shrank. Today a one thousand-foot freighter has a crew of twenty-one- enough people to sail the ship at sea. The Watch standers are coming and going with very little idle time. I have had the opportunity to talk with seamen from World War II era who spent hours doing rope-craft. One Sea Captain told me a story about his knot work project that he was working on prior to the Invasion of Normandy. He was working on a belt and pacing the bridge in the hours before the landing. He trailed the strings behind him so that he could carry on with the project, and call attention to what he was doing instead of the war around them. He was reducing the mental tension on the bridge. What he had done must have worked because he was telling me the story.